Draft: 2015, San Diego Padres, 17th rd. Anthony (Trey) James Wingenter…son of Tony and Rhonda…has one sister, Kathryn...one of his grandfathers served in the US Army...attended Auburn University (AL) where he struck out 22 batters in 24.1 IP during his sophomore year (2014)…graduated from Bob Jones High School (AL) where he threw five shutouts and three no-hitters…named 2012 Huntsville Pitcher of the Year and 2012 ASWA All-State 6A First Team Pitcher...has a dog named Lucy...enjoys listening to Pearl Jam...his favorite TV show is Westworld and his favorite movie is Pulp Fiction...is a fan of Samuel L. Jackson movies...roots for the Carolina Panthers. Wingenter (pronounced WING-enter) spent the majority of the season with El Paso (AAA) before making his ML debut with SD on 8/7...made 22 appearances out of the Padres bullpen...Posted a 3.45 ERA (17 ER, 44.1 IP) and ranked second among ELP relievers in appearances (40) and SO (53), third in saves (four) and fourth in IP (44.1)...Was scoreless in 15 of his final 16 outings with ELP, converting all six of his save opportunities while posting a 1.06 ERA (2 ER, 17.0 IP) with a .155 opponent average before earning his first big league call up on 8/5...Made his ML debut on 8/7 at MIL, recording the final three outs of SD's 11-5 win and retiring each of the three batters he faced...Struck out each of the three batters he faced on 9/12 at SEA...his three strikeouts were part of a franchise-best nine consecutive strikeouts among relievers, along with Jose Castillo, Robert Stock and Craig Stammen...Allowed two runs on just one occasion, one run six times and no runs 15 times... Limited lefties to a .152 average (5-for-33) and righties to a .229 clip (8-for-35)...Posted a 2.79 ERA (3 ER, 9.2 IP) on the road compared to a 4.82 ERA (5 ER, 9.1 IP) at home...Relied on four pitches: four-seamer (67.4%), slider (31.1%), sinker (1.2%) and changeup (0.3%). Spent the entire regular season with San Antonio (AA), earning several league honors throughout the year...Led the Texas League in saves after converting 20 of his 26 save opportunities and ranked second in games finished (37)...Named an MiLB.com Organizational All-Star for San Diego as well as a Texas League Mid-Season and Post-Season All-Star...Limited right-handed hitters to a .194 batting average while lefties hit just .192 against him...Posted a 1-1 record over 24 games at home with a 0.81 ERA (2 ER, 22.1 IP) and 35 SO against six BB...Received the first postseason action of his career, tossing a scoreless ninth inning to earn the save in the Missions' 4-3 Game 2 victory to even the series against three-time defending champion Midland..blew the save in the club's 6-3 Game 4 loss, allowing two earned runs without recording an out...Promoted to El Paso (AAA) for their postseason run, tossing 3.0 scoreless innings over three appearances, allowing just one hit while striking out five and walking two. 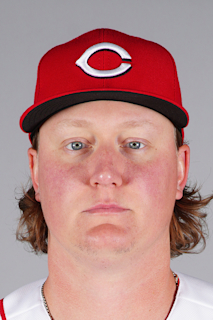 Split the season between Fort Wayne (A), Lake Elsinore (A) and San Antonio (AA), pitching to a combined 3-1 record and a 1.70 ERA (11 ER, 58.1 IP) with 65 SO against 20 BB over 39 relief appearances...Did not allow an earned run in his first eight appearances between Lake Elsinore and Fort Wayne...Went 2-0 over 16 appearances on the road with Lake Elsinore with a 1.17 ERA (3 ER, 23.0 IP) while he was 0-1 with a 2.95 ERA (7 ER, 21.1 IP) over 14 games at home...Twice tossed a career-high 3.0 scoreless innings. Split his first professional season between the AZL Padres (R) and Tri-City (A), posting a combined 1-2 record with a 7.23 ERA (15 ER, 18.2 IP) over 12 relief appearances...Earned his first professional win on 8/24 vs. AZL Brewers, working 2.0 scoreless innings in relief...Held opponents scoreless in four of his last five outings on the season. August 5, 2018 San Diego Padres selected the contract of RHP Trey Wingenter from El Paso Chihuahuas. January 18, 2018 San Diego Padres invited non-roster RHP Trey Wingenter to spring training. September 12, 2017 RHP Trey Wingenter assigned to El Paso Chihuahuas from San Antonio Missions. April 4, 2017 RHP Trey Wingenter assigned to San Antonio Missions from Lake Elsinore Storm. March 10, 2017 RHP Trey Wingenter assigned to San Diego Padres. August 12, 2016 RHP Trey Wingenter assigned to Lake Elsinore Storm from San Antonio Missions. August 9, 2016 RHP Trey Wingenter assigned to San Antonio Missions from Lake Elsinore Storm. June 6, 2016 RHP Trey Wingenter assigned to Lake Elsinore Storm from Fort Wayne TinCaps. May 5, 2016 RHP Trey Wingenter assigned to Fort Wayne TinCaps from Lake Elsinore Storm. April 28, 2016 RHP Trey Wingenter assigned to Lake Elsinore Storm from Tri-City Dust Devils. August 31, 2015 RHP Trey Wingenter assigned to Tri-City Dust Devils from AZL Padres. August 5, 2015 RHP Trey Wingenter assigned to AZL Padres from Tri-City Dust Devils. June 17, 2015 RHP Trey Wingenter assigned to Tri-City Dust Devils. June 16, 2015 San Diego Padres signed RHP Anthony Wingenter.